Not to be confused with the Jodie Foster film, Flight Plan is a new mobile app that takes the stress out of air travel by notifying users of wait times at security checkpoints and baggage check-in, traffic at airports, flight updates, public transportation schedules for departure at arrival cities, and much more. With Flight Plan, flying becomes a little more organized and a little less burdensome. This project was a capstone project completed during Designlab’s UX Academy. Design a mobile application with push notifications and customized account preferences, as well as establish brand guidelines. 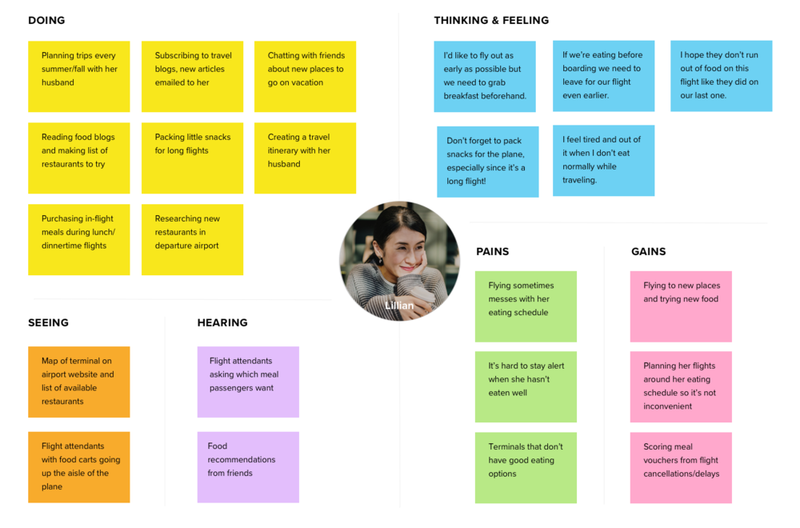 Identify pain points and frustrations travelers face when dealing with air travel. Find out workarounds and solutions people come up with to make the flying experience better for themselves. 92% of travelers agree that today’s air travel experience “leaves a lot to be desired.” A survey of over 4,000 people found that 28% of people stress the most about researching and booking their trip while 48.5% of people said the most stressful part was the pre-boarding process (airfarewatchdog.com). 40% of people experience some degree of anxiety over air travel (nytimes.com). According to the J.D. Power 2018 North America Airport Satisfaction Study, across-the-board improvements in airports—including check-in; food, beverage, and retail; accessibility; terminal facilities; and baggage claim—helped drive overall passenger satisfaction to 761 (on a 1,000-point scale). 90% of people book their flight with self-service technologies. 92% of people are extremely or very satisfied with their check-in experience. 64% of people would track their bag in real-time via a mobile app. 57% of people would definitely use biometrics instead of a passport or boarding pass. 52% of people use WiFi once they pass security and reach their gate. 74% of people would use alerts about their flight and gate pushed to their mobile device if available. 22% of people received baggage claim notifications on their mobile devices upon arrival. Over 50% of participants like to plan ahead when it comes to flying. Over 50% of participants send their flight information to friends and/or family. Over 60% of participants stick to a “routine” when they fly. The majority of them leave 2 hours before their flight no matter what. 75% of participants ranked dealing with security lines as the most frustrating part of flying. Runners up include: flight delays and/or cancellations and traffic/crowds at the airport. One participant said she knows the pre-boarding process is cumbersome but doesn’t see how it can’t be cumbersome given the number of people who fly on a daily basis. All 3 participants said they have a routine that they follow the day of their flight. 2 out of 3 live far from the airport so they factor that into when they leave home. 1 lives closer to the airport but still leaves with enough cushion time for those “just in case” instances. Every participant uses a different mode of transportation to get to the airport: varies from friends/family driving, Uber/Lyft, and scheduling a taxi. Lack of reliable public transportation at some US airports. Not knowing whether or not the plane will serve enough food especially on flights during regular mealtimes. The Federal Aviation Administration reported that 2,587,000 passengers flew in and out of US airports every day in 2017. That’s 2.5 million people every day trying to get from Point A to Point B with little to no hassle. Yet while industry experts claim that air travel has never been better, many people today still feel negatively towards the flying experience. In my research, I attempted to uncover exactly why that is. I found that steps in the process like security checkpoints and crowds are people’s biggest pain points when flying. Studies show that people feel a general sense of powerlessness the moment they step into an airport: they are herded into lines like cattle, told what to do over loud speakers, yelled at if they step out of line. Those who travel frequently have thoughts on how technology can help improve their traveling experience, such as an app that can accurately predict wait times the day of your flight so you can schedule your day accordingly. I discovered that when there are clear pain points in a process or experience, there are also clear windows of opportunity for solutions. There are many different types of travelers, however, for this particular project I chose to develop 3 main personas based on findings from my secondary research, online survey, and interviews. 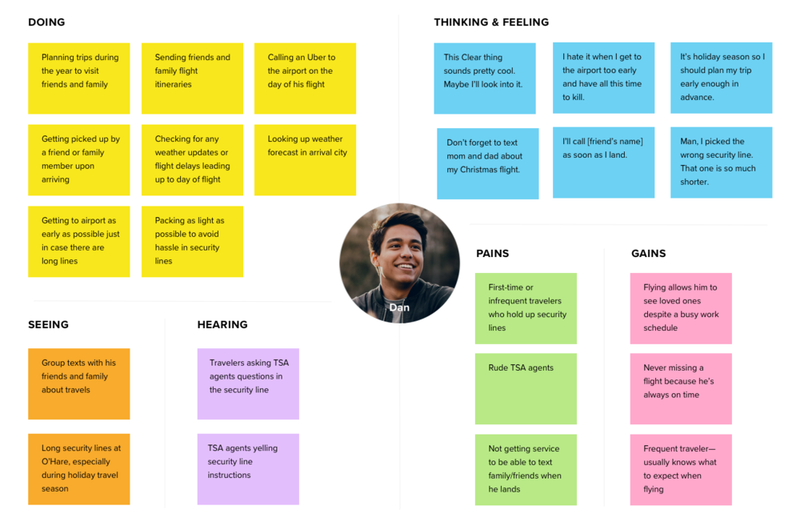 I generated an empathy map for each of my 3 personas, since each of them had different needs and goals. 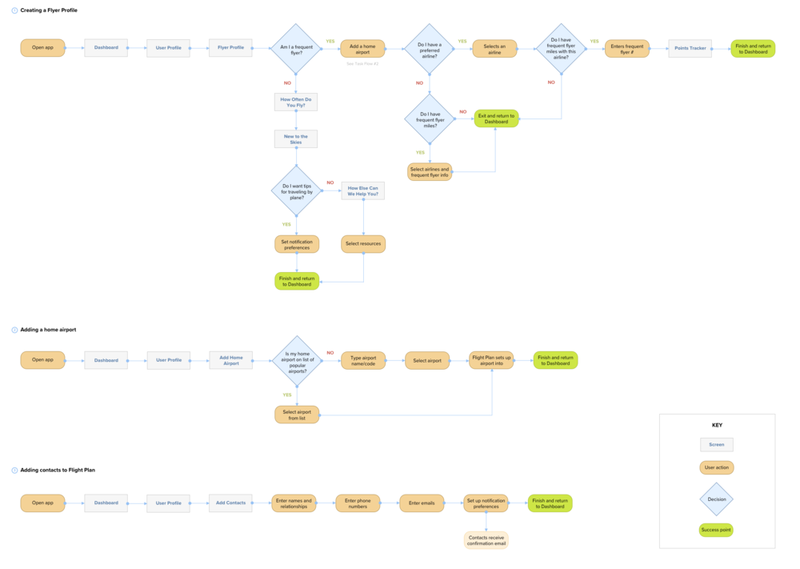 Using what I knew about the app’s potential audience and their needs, as well as the project’s background and goals, I outlined a sitemap for Flight Plan. I decided to organize the navigation of the app by “steps” in the flying experience. 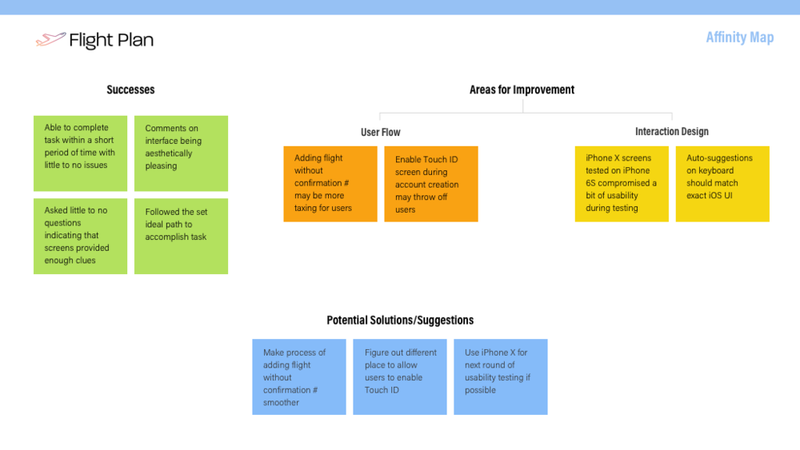 Brainstorming and defining some of the key features of the app was extremely helpful when considering task and user flows. 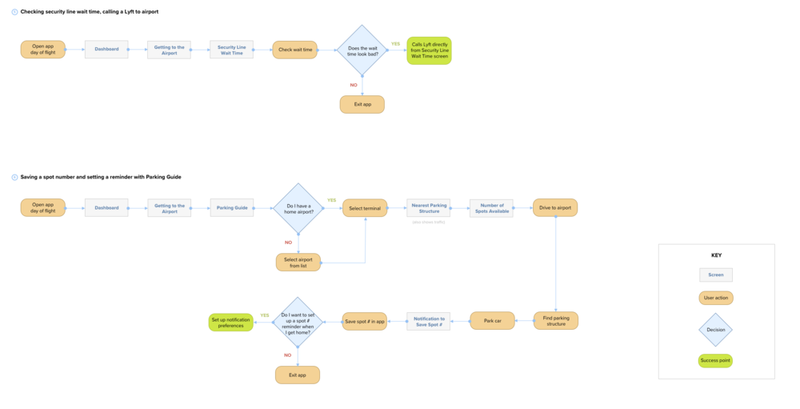 What paths might Flight Plan’s users follow given their goals? I mapped out the screens they would see below. 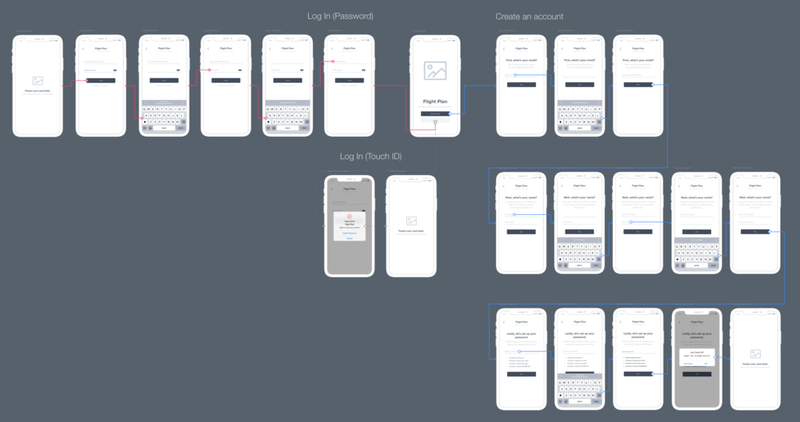 Once I nailed down my wireframes and subsequent user flows, I turned to InVision to prepare for usability testing. Flight Plan’s brand was inspired by many early morning flights that I have taken out of LAX, when the clouds are a soft purple/blue and contrasts perfectly with the orange/pink hues from the rising sun. The photo to the left is a picture I took on one of those flights! I aimed to make the app’s brand as warm and lighthearted as possible to contrast the stress of traveling by air. A preview of Flight Plan screens with branding and UI plugged in. The participant’s task was to create an account with Flight Plan and add a flight (given a confirmation number) to his Trips Dashboard. Did not run into any major issues while testing the prototype. Also asked little to no questions along the way indicating that the screens provided enough context and clues. Successfully completed the task in less than 5 minutes. Mentioned that it was strange to see screens designed for iPhone X on an iPhone 6S (which was used during testing). Having to scroll down to access the keyboard, for example, threw him off a bit. He was curious to know how users who didn’t have a confirmation number would use the app. He did not notice the option to browse flights below the confirmation number form field, which might have been because he was focused on the task at hand. But this brings up a potential issue of people feeling like they can’t use the app if they don’t have a confirmation number. 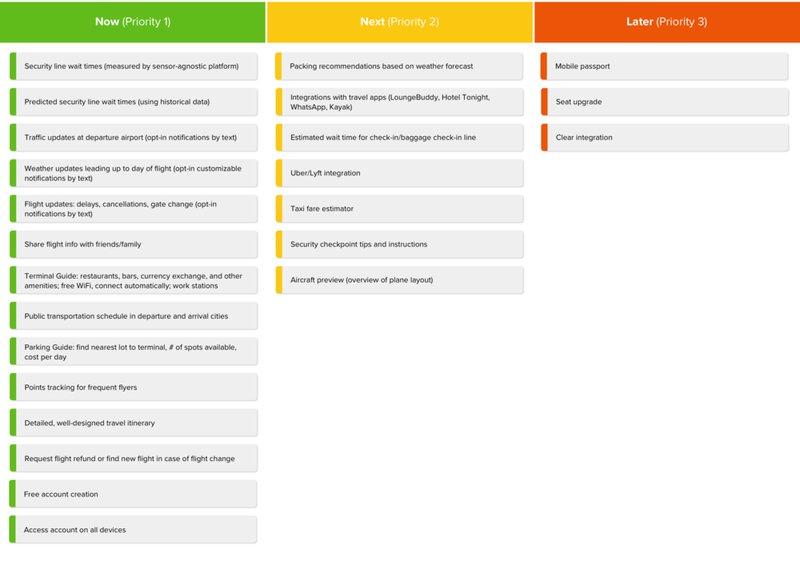 I created an affinity map to sort and prioritize the successes, areas for improvement, and potential solutions based on usability testing results. With more time, it would have been interesting to test the app on more users and also use an iPhone X to ensure screen dimensions matched the prototype. Then, the next logical step would be revisiting my wireframes and making adjustments wherever necessary based on usability testing feedback. Applying Flight Plan’s UI to all screens to prepare for hand-off to developers. 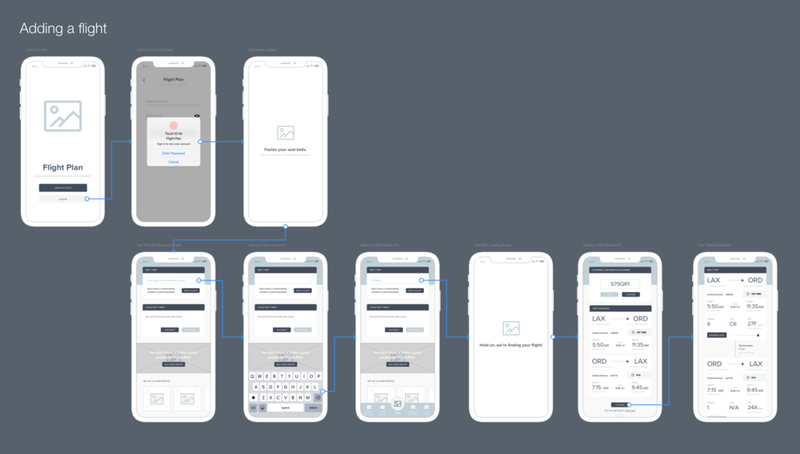 Designing a landing page for the app, as well as the App Store download page.